I have a pair of Look Keo Max 2 blades and the toe part of the pedal has lost it's shape and no longer holds on to the cleat on the shoe. I can't find replacement parts for it, but I can find parts for other related blade pedals, but I'm not certain if the dimensions of the parts are the same, and thus interchangeable. Does anyone know or have any recommendations on how to fix this? On a related note, is it possible that Shimano Ultegra pedals would wear better? Which part do you mean? The front, which I would take it that your describing as the 'toe', is the pedal! thinking the only way your fix it, is to replace the with a new pedal. There are some spares avaiable for Look Keo Max 2 pedals, but you need to look at the condition of the pedals and the cost of the spares, vs just replacing them with new pedals. Really wondering what you have done to get the pedal out of shape, they have a composite body, which doesn't want to bend/go out of shape under normal use. Beyond this problem with the pedal being unable to hold on to the cleat when I get out of the saddle and pull, they are in great shape. They are less than a year old, and everything else works well. They spin well, the spring doing the engagement is fine, etc. I have attached a stock photo of the pedals with an arrow indicating where the wear is. If there are spares available for those pedals, could you point me to retailers that have them? I have looked, and I can't find any. The only ones I can find are for the Keo 2 Max (non-blade), or the Keo Blade, but I'm unclear if the replacement parts for the other Keo Blade pedals will work because they may have slightly different dimension. I think that is the main pedal body that would need replacing. I googled and could not find anything, have you tried contacting Look? I have numerous pairs of Keo 2 Max pedals with years of wear and that part of the pedal body looks relatively unworn. Yes almost any pedal will wear better than that! I agree. The front of the pedal IS the pedal—it is all one piece. The only parts that are removable are the cleat and the blade. It is hard to imagine what kind of use the pedal was subjected to in order to damage the front. To the OP, there are no photos in your post. Maybe contacting LOOK might help. The pedal after all is relatively new. here is a photo showing which part of the pedal I am referring to. The pedals are a year old but they have about 10,000 kilometers on them. I ride with them all year long. I ride between 250k and 400k per week. In the sun. In the rain. In the wind. In the snow. through the winter, so they get wet and grit on them, and then the road grit which gets in between the cleat and the pedal causes this type of wear. Guys, if you can’t be helpful other than wondering what kind of “abuse” they received or denying that repair parr’s exist when they clearly do, then don’t bother. Seriously; saying something doesn’t exist is a strong statement about knowing something for a fact, as opposed to being merely unaware of their existence. You are sort of being jerks. Your problem is that you keep referring to the “toe part” of the pedal. The “toe part” of the pedal is the front of the pedal and it is an integral part of the pedal. This is the reason why everyone is wondering about the “use” or “abuse” that your pedals have been subjected. That part of the pedal is nearly unbreakable. 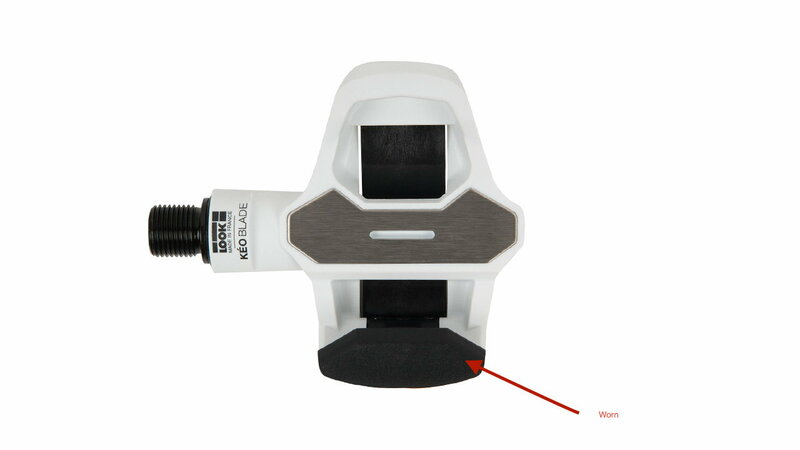 Thepart shown on your picture is the “cleat.” That part does wear out, hence its inclusion in the repair kit. There are YouTube videos showing the proper procedure for replacing the blade, and the cleat if necessary. Follow the procedure or you will mess up the mechanism. BTW, 10,000 km a year is impressive but by no means “extraordinary.” Many people here do that, or more. You might want to post some photos, since that would clarify the issue and help people to respond with solid advice. Alternatively, you might want to buy some new pedals - those are not very expensive. And if yours really are worn out, try getting a warranty replacement since they are <1 year old. Then you would have a backup pair of pedals. Last edited by alcjphil; 02-03-19 at 01:03 PM. He posted a picture showing exactly the part that failed. LOOK Keo blade pedals are not inexpensive. Right you are. I missed the photo and was looking at the wrong petals.Still, if under one year old it should be covered under warranty, shouldn’t it? Depending on mileage and riding conditions, the cleats can wear out. Some of my riding is coastal, right on PCH. The pedals puck up a lot of grit and grime. Because of that I clean the pedals regularly, even taking them apart. That seems to work for me. Should I get Hyperglide with new 6spd Freewheel?